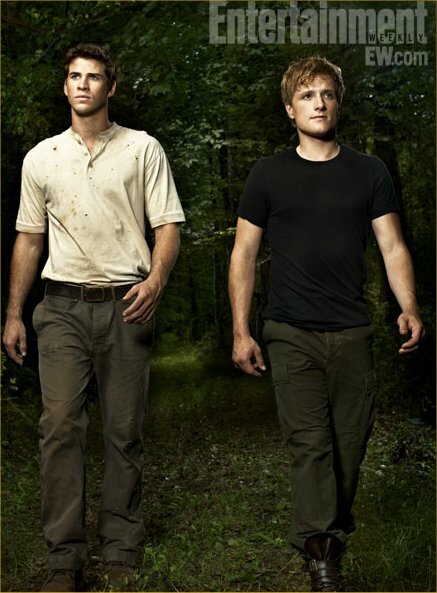 TOPAZ HORIZON: Team Peeta vs Team Gale? Puh-leeze. I haven't watched Hunger Games yet but it is definitely the movie to watch this weekend. So since I haven't watched it, I'm not doing a movie review. I'll just tell you why Vince thinks there's no contest between Gale and Peeta (guy in black shirt). Yes, my husband read the book! Seems like everyone's taking sides on which boy Katniss should pick. Vince says Gale never had a chance. And his reason is simple: If the girl you cared for was picked to go to the Hunger Games, you'd volunteer to take her place. That's what Katniss did for her sister. Vince said, "That's what I'd do for you." He added that he'd make sure he'd win, too, so that he can come back to me, with all the lifetime winnings of a champion, and take care of me! Well, it's always been obvious to me that Peeta wins hands down but my reason is silly. Peeta had me at "She came here with me." There could be no other guy after that! Enjoy your weekend! I wanna read the books so if only for that kilig line! =) And of course, watch the movie, too! You might not understand this because you didn't read the book, but they're supposed to choose one girl and one guy for the Games. Katniss taking her sister's place makes sense and works because they are both girls. Unfortunately, Gale cannot take her place because he is a dude. Wonder Woman, thanks for clearing that up. I don't know where you got that I didn't read the book, though. I said I didn't watch the movie. And we're not going to actually. Hubby thinks the book is a poor copy of Battle Royale, an opinion I agree with. So I guess it was obvious we were just flipping through the pages since we didn't like the book that much! Oops! That's a really interesting comment from Wonder Woman. Alam mo F, I read the book kasi you recommended it. haha! And you described it as something similar to Running Man. So obviously you read it! Rachel, hey, I never said that! I know because I've never read/watched Running Man. Really? It must have been someone else. Anyway, I agree the HG is waaaaay better than Twilight although I went gaga over Twilight during it's hype. Team Peeta, all the way! You must watch that movie scene when Peeta said that line, "She came here with me.". At least, watch that scene. I died when he said that. anyway, i was very happy with the film. and i am very happy for jennifer lawrence that she didn't get the 'bella' part. katniss is the better character! hihihi. (somone told me she read for 'bella'. is this true?